Sennheiser makes some of the best headphones in the world but it's taken a cautious approach to incorporating Bluetooth. However, finally completing a line-up that now includes over-ear, on-ear, in-ear, necklace and noise-cancelling, wireless cans is its first workout-friendly headset with Bluetooth: CX Sport. Looking remarkably like T3's current favourite workout headphones, Optoma NuForce BeSport 3 and Monster's iSport Victory, the CX Sport stays firmly in place via the miracle of flexible silicon fins. They're also ultra-lightweight and, of course, sweat and splash-resistant. Just the thing for workouts, running and desks that you pedal, these sporty in-ear buds can be worn "around the neck or in front," while a "cable organiser" adjusts the length to minimise irritating flapping at the back of your neck (or front, if you wear them that way). 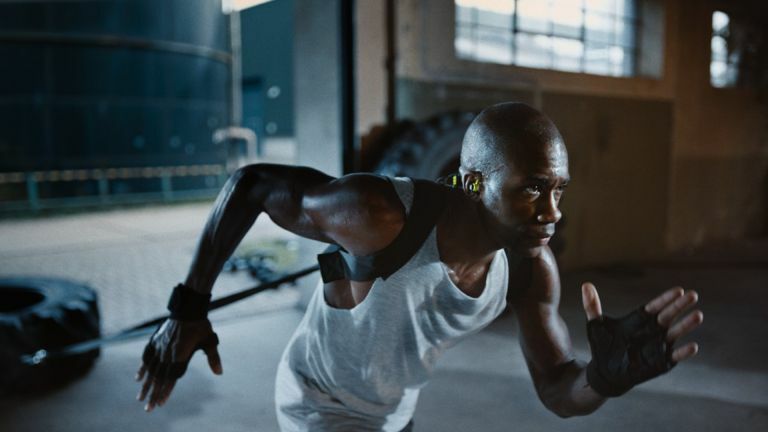 An optional clip lets you fix the CX Sport "on the workout shirt", as Sennheiser puts it. They're German. With three fin sizes and four bud sizes it should be easy to achieve a perfect fit, even if you have grotesquely misshapen ears. With the focus on keeping noise out, these are not for runners who prefer more situational awareness. Most of the most recent Bluetooth features are on board, so you can connect the headphones to two devices simultaneously, while Qualcomm's Apt-X and Low Latency technologies mean improved wireless sound quality and less lag when watching video. The 'proprietary speaker system' promises clear and detailed sound with a focus on bass. The CX Sport has a six-hour battery life, with ten minutes of charging giving you another hour of music to soundtrack physical exertion. They are fully charged in just 90 minutes. A three-button inline remote manages music and calls, while a soothing female robot voice will give audible updates on pairing and battery status when you turn the headphones on. In other words, the CX Sport is a completely textbook pair of contemporary gym and running headphones. Where they will hopefully excel is in sound quality, because that is where Sennheiser usually beats its competition. We'll have a review ASAP.